Zootopia is another example of the originality and creativity in contemporary animated films (e.g. Inside Out, The LEGGO Movie). I admit that it took me a few minutes to get into this story of a young rabbit named Judy Hopps (voiced by Ginnifer Goodwin), who wants to leave her family farm and become a police officer in the large neighboring city, Zootopia. A word play on Thomas More’s Utopia, the city of Zootopia is a place where anthropomorphic animals of all kinds live and work together in harmony. But after a few minutes I was hooked on the great storytelling and humor of the film. 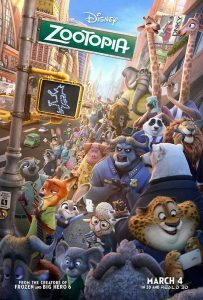 Judy goes to Zootopia and finds that all is not perfect in the big city. The police chief does not appreciate her ambition to become a cop, and assigns her to be a meter maid. Under protest, Judy takes on the job. Soon she encounters a crafty fox named Nick Wilde (voiced by Jason Bateman) in the midst of a con job. As in Hollywood style, enemies Judy and Nick end up working together on the case of a missing otter. In the best buddy tradition of Hollywood, Judy and Nick grow to be friends and appreciate each other. Zootopia surprises in its rich character development and narrative. Again, as in true Hollywood tradition, the case of the missing otter takes unexpected twists and turns, discovering that there’s much more to the case than meets the eye. As such, Zootopia borrows from the best tradition of the film noir detective movies. There are many odd characters and funny moments along the way to the solving of the mystery. Perhaps the most memorable occurs when Judy and Nick encounter a bureaucratic office run by sloths, who take forever to process their requests. Anyone who has ever spent a day in the DMV getting a driver’s license will love this sequence. However, Zootopia is not just a pleasant diversion to amuse the kids for a couple of hours. It has a lot to say about stereotypes and deep-seeded prejudices in a diverse society. When the case of the missing otter is solved, there’s even a message about leaders who lead by appealing to the fears and prejudices of their citizens. There’s an appropriate message for us in this election year! At the end of the movie, the moralizing is a little heavy, but not so much to spoil the movie. As I’ve said many times before, the best animated movies aren’t just for kids. They have a way of telling good stories that can appeal to both adults and children. Zootopia is a great example of such a movie. Thanks to the clever filmmaking of writer-director Byron Howard (who also worked on the entertaining retelling of the Rapunzel story, Tangled) and his team of animators and writers, Zootopia is a smart animated film that appeals to all age groups. The fact that it has already become a big hit with audiences and critics speaks to its appeal now, and hopefully for years to come. I imagine the inevitable sequels will come. But the original will be hard to beat.